Gioco Saturday night. 6:00 pm reservation because we had plans. We arrived right on time and were astonished at how full this fairly large place already was. Maybe everyone else had plans, too. For those who have never been, the room is high-ceilinged and brick walled, hardwood floors. Very attractive and very noisy. (Though, in fairness, we did not have much trouble hearing each other.) Along the left-hand wall as you enter is the maitre d’s station and then a long bar, culminating in the servers’ order station. Then, on the right, two long parallel rows, predominantly two-tops. We were the last table in the row immediately to the right of this long “aisle.” The entire time we were there, virtually every couple, group, and marauding horde marched past us to get to their table. Immediately behind us, the kitchen’s flight deck: every dish coming out of the kitchen flew past. Sitting at the confluence was not pleasant. The absolute least they could do is put some kind of furniture/screen/etc. to help partition or shelter diners from the constant (and I mean constant) traffic. The first two things we noticed after being seated were (1) the large number of staff on hand and (2) the urgency with which they all moved. They didn’t run, they didn’t hurry, but the pace was what Shakespeare might have called “the stride purposeful.” After a while, you get tired just seeing so damn much intensity. We split an artichoke tart to start. Although it looked for all the world like a small apple tart, the flavor was very good. Small slices of perfectly-done artichoke, caramelized fennel, red onion, and (supposedly) a green olive and oven-dried tomato emulsion. Neither one of us could identify anything like green olive or tomato; instead, there was a dab of tangy white sauce with several sprigs of fresh thyme. No matter. Although I found the crust had a nice flavor, I thought it a little soggy, as if stored somewhat less than appropriately. A pity, since the execution, presentation, and flavor were fine. Which leads to my parenthetical question. I have not had a chance to do my research. Is saltimbocca a regional dish prepared differently in different places? That seems entirely plausible to me, my experience notwithstanding. I believe the “standard” presentation is alla romana and includes the prosciutto. But elsewhere, I suppose, it might be dispensed with. I know that every time I have ever had it, it has had the prosciutto and never had cheese. In retrospect, I may have always seen (and ordered) saltimbocca alla romana and the menu at Gioco may not have been Roman-style. In all honesty, I don’t believe that the menu said alla Romana. So maybe I had an unfamiliar version. I’d be grateful for any enlightenment. Bread: very good, but not more. Wine (2005 Cycles Gladiator Pinot Noir) fair to middling. Dessert: top-notch. As I have noted in other reviews, I’m a sucker for good sorbet. Sadly, too few dessert chefs seem to make them with the intense flavors I enjoy. Indeed, two of my most vivid memories are of opposite experiences: at Pili Pili (Fred Ramos’ last restaurant), the offerings were flat-out insipid. At Aria, perhaps the best I’ve ever had. Gioco’s ran a close second (to Aria). I chose the three sorbets on offer (there were three sorbetti, three gelati). The sorbetti were peach almond, passionfruit, and raspberry. LDC also had the passionfruit and raspberry and elected butter pecan gelato for her third. Every single flavor was concentrated, fully realized, and exactly right. Not too sweet, no slightly off finishes. Just exactly what you should get. Dinner, tax, and tip (one entrée, one glass of wine, two desserts, no coffee): $88. We will be back, but I will insist on a table either in the “back room” or somewhere other than the flight deck. I think we will also try to go on an evening when the pace should be a little less frenetic. We liked the menu choices, liked the food for the most part, and enjoyed the place itself. It was just the “other” things like the location of our table and its constant, very busy feel. Seated at the confluence of the new arrivals’ landing strip and the servers’ launching pad, there was way too much traffic. And it didn’t help that the staff chose this spot for their quick conversations: “That’s a glass of Pinot over at table 62, please.” “Check and see if they need anything over there.” “Can you get some more water to 45?” “What do you need?” Traffic or talk, the entire time we were there. I don’t blame them for doing their job; I just wish they had chosen another location to talk (plenty were available) or that the designer had spent a little more time thinking about the diners’ experience. Friday and Saturday 5 p.m. to midnight; Sunday 5p.m. to 10 p.m. Gypsy Boy wrote: Which leads to my parenthetical question. I have not had a chance to do my research. Is saltimbocca a regional dish prepared differently in different places? That seems entirely plausible to me, my experience notwithstanding. I believe the “standard” presentation is alla romana and includes the prosciutto. But elsewhere, I suppose, it might be dispensed with. I know that every time I have ever had it, it has had the prosciutto and never had cheese. In retrospect, I may have always seen (and ordered) saltimbocca alla romana and the menu at Gioco may not have been Roman-style. In all honesty, I don’t believe that the menu said alla Romana. So maybe I had an unfamiliar version. I’d be grateful for any enlightenment.experience. A very reasonable question... To my mind, they've perhaps done something naughty here if they didn't give some indication that the dish was not the Roman classic. Saltimbocca alla romana is one of the fairly limited number of regional dishes (this one obviously thought of as being from Rome) which has been raised up to the level of inclusion in a sort of national Italian cuisine and consequently it is known all across Italy and is also very well known to fans of Italian cuisine in other countries. You were completely right, in my estimation, to expect that the dish would include prosciutto (crudo) and that it would not include any cheese. Indeed, this is -- like spaghetti alla carbonara and so many others -- one of those quintessentially Roman and quintessentially simple recipes: butter, veal, fresh sage, prosciutto crudo, salt, pepper and that's it. One might mix a little olive oil with the butter for the cooking or deglaze with a little white wine and the dish could still be called saltimbocca alla romana but that's pretty much it; minor variations but no alteration of the basic veal-prosciutto-sage combination that is the essence of the dish (and a remarkably delicious combination at that). Now, you conjecture that the name saltimbocca, ohne weiteres, perhaps has further applications and I would say that that is definitely so. I've seen (in Italy as well as elsewhere) things like saltimbocca alla napoletana or alla sorrentina or al marsala or alla fantasia dello stronzo che sta faticando in questo ristorante and that's all on the up and up to my mind. You expect a variation on the saltimbocca alla romana theme and have been warned that it won't be the canonical Roman version with sage and prosciutto. But if a restaurant offers saltimbocca with no further qualifying element to the title of the dish, I think one should expect the classic. Just as one should be able to order with confidence pasta alla carbonara and expect a dressing of nothing more than eggs and cured pork and pecorino romano and pepper. In other words, it's obviously absolutely reasonable for them to do their own take on saltimbocca (and a version with cheese of one sort or another is hardly unheard of) but they should let people know that it deviates from the classic and how it deviates. The frivolous or promiscuous use of traditional names that for Italians have very set meanings is one of the many reasons why I generally find Italian restaurants in America to be, at best, disappointing. I don't begrudge Chef's their fantasies (well, sometimes I do) but I expect serious chefs to understand and respect tradition, even -- perhaps especially -- when they choose to do something outside the tradition. Grazie mille. As always. As I noted in my original post, I honestly do not believe that the menu said "alla Romana." (Sadly, the online menu does not include the saltimbocca.) To the best of my (increasingly poor) recollection, the dish was labeled something like "vitello al(la?) saltimbocca." Is that possible? I remember distinctly that it was not labelled alla Romana. It simply didn't occur to me that something might be up. And, being the quiet, mousey type, I didn't bother to ask if the Gioco version differed in any way from the common Roman style. Under the circumstances, it might have been a nice gesture if the server mentioned the divergence from the common presentation, but I cannot fault him for failing to do so. And so we learn. Am I correct in presuming that the cheese was likely provolone? And am I further correct in presuming that con formaggio is more likely to be from the northern provinces, nearer the Swiss border? Oh, I don't know about that... I think in general variations on this dish in Italy more often than not don't have cheese but when they do they can be from anywhere and then the kind of cheese used will likely be parmesan or else vary according to regional preferences. I've seen (and made) variations on the theme with shavings of parmigiano; I've also seen mozzarella included in lots of American restaurant versions and in some recipes from Southern Italy, e.g. "saltimbocca alla sorrentina," which is nice but too busy for my more austere Ciceronian or Catonian tastes. Being that I am a longtime lurker, here it goes - into the fire! We visited Gioco last night after not having been there in about a year. Considering I had wanted to visit one of several less expensive restaurants yesterday evening, all of which are closed on Monday (Coalfire, Spacca Napoli, and Frontera Grill), I was still pleasantly surprised with Gioco, and thought Fred Ramos' kitchen did a much better job than any of the other groups that ran the restaurant in the past four years. My Wife and I were seated promptly at 7:00 PM; the place was really bustling for a Monday night. We were both glad to be seated far enough away from the kitchen and bar to observe and not be directly involved. The night was to be a bit of a "celebration of new-found employment" for me, so we started out with cocktails and some "calamari fritti"...I was immediately happy with this decision since our server could provide a few blue cheese (I think gorgonzola) stuffed olives for my vodka. The calamari came out still sizzling from the fryer, very fresh, looking rustic and hand cut...having fried lemon slices, garlic cloves, and basil leaves interspersed throughout, the presentation was enticing (for lack of a better word). With a creamy, chile studded tartar sauce and a spicy marinara for dipping, the calamari was the best I'd had in a long time, and the perfect comforting start. For our main courses I decided I "needed" a steak and ordered the bone in ribeye; my wife went with her usual hand made pasta fix by ordering the tortelloni filled with ricotta and spinach in a butter/ pecorino toscana/ sage sauce. The pasta was spot on. Obviously handmade and filled with care, the few bites I had revealed that one could actually tell exactly what the pasta was filled with by the slightly crunchy spinach texture and creamy ricotta background, as opposed to just biting into a mess of gooey starchy cheese with spinach flecks (which I was expecting to a certain degree!). The tortelloni sauce turned out to be deliciously light and flavorful. Verging on being more of a broth infused with sage, then topped with butter, pecorino toscano and a drizzle of balsamic reduction, this presentation seemed much more authentic Tuscan to me than a concoction that took a spin in a blender mid-afternoon. This type of care is what sets Gioco apart from other places. For my taste (I'm not a connoisseur of prime dry aged beef by any means) the bone in ribeye was delicious. My steak was perfectly cooked on the rare side of medium, salty, flavorful, and oozing a nice amount of juice to coat the tasty, included, garlic-y mashed potatoes served beneath it. Not exactly a great value at $35, but probably priced well relative to the upper level steakhouses in the area (the steak was a notch below Keefer's and Gene and Georgetti). With a nice bottle of 2003 Dashe Zinfandel, and competent service, our night was very nice and we will be back to Gioco sooner rather than later. Last edited by rober on June 13th, 2007, 6:43 am, edited 1 time in total. Gypsy Boy wrote: Grazie mille. As always. As I noted in my original post, I honestly do not believe that the menu said "alla Romana." (Sadly, the online menu does not include the saltimbocca.) To the best of my (increasingly poor) recollection, the dish was labeled something like "vitello al(la?) saltimbocca." Is that possible? I remember distinctly that it was not labelled alla Romana. I think that the addition of "vitello" is to let you know it's not chicken, as a large number of places in Chicago (and perhaps elsewhere in the US) use chicken instead of veal, calling it "chicken saltimbocca" -- which is pleasant, but doesn't really want to "jump into my mouth." Rober wrote: Being that I am a longtime lurker, here it goes - into the fire! And Rober -- thanks for taking the big step from lurker to poster. Your additional input on Gioco makes it sound appealing. And congratulations on the new job you were celebrating. I've had good meals at Gioco in the past--always good, never great, but it has been a place that I'm always happy to visit. So I was surprised that my meal last night was a bit of a disaster. Dishes I had enjoyed in the past were not up to snuff. For instance, wild boar pasta was watery and way too sweet. They couldn't even manage to produce dessert. After 20 minutes of waiting we just decided to cancel our order and go home. You might think they would have at least comped the coffee and dessert wine he had ordered in anticipation of dessert, but if so you'd be thinking wrong. So then I come home and read in Dish that Fred Ramos, Gioco's chef, has been called upon to run things at Room 21, where the chef just quit. So I think this probably isn't the ideal time to be trying Gioco. Don't get me wrong: I like this restaurant. But it doesn't seem to be running full steam at the moment. Let's hope Fred Ramos returns soon. berryberry wrote: wild boar pasta was watery and way too sweet. They couldn't even manage to produce dessert. but she goes back because she really likes the papperdelle with cinghiale, which i think is the same thing you didn't like. I can't remember if this is what the dish was called or not. But let me clarify my point. I order the wild boar pasta regularly and had always enjoyed it in the past. But last night it was just off. The whole experience was just off. Went to Gioco with the lovely Stevez last night and was very pleased to see that it was on, that it was striding purposefully, that we were seated in the main room by the bar (not the back room, too bright, like a party room at an Elk's Club; and not next to the frying pan and the fire, ether) and that-- this is the main thing-- it was a damned good meal. What's more, after a number of meals that seemed to go gently but unmistakably downhill from start to finish, Gioco got better and better. I have no idea if Fred Ramos was here or 21 rooms away, but somebody was running that kitchen to a fine how-do-ye-do. Gypsy Boy said the bread was good, not great, but I thought it was quite good and the subtly garlic and herb accented olive oil we had to dip it in was, to use the small town restaurant reviewer's favorite adjective, addictive. We started with a goat cheese and mushroom pizza, too much goat cheese and the crust was oddly insubstantial for something having just come from the brilliant orange oven glowing 5 or 6 yards away. Follia's is better, the dedicated woodburning pizza oven places, Spacca Coalfire, are much better. Next up we split half portions of a couple of pastas. One was the wild boar-- not that much flavor in the boar ragu, surprisingly, but at least the papardelle had a perfect toothsome texture. Gnocchi in a cream sauce with a hint of truffle were better yet, maybe a hair large for gnocchi, rendering them a bit too gummy-chewy, but not bad by any means and the sauce was richly complex and satisfying, creamy, savory, truffley and salty by turns. Reading that over it sounds more critical than I felt at the time-- certainly among the best pastas I've had in the last year or more. Then, a brined pork chop, cooked over wood somewhere back there (presumably not the same fire as the pizzas). This was terrific, flat-out terrific, subtle notes of different things in the brine like orange juice, all accented by a smoky flavor that managed to be light and deep at the same time. Cooked perfectly, quality pork that tasted of pork (even though the menu didn't offer a big song and dance about Berkshire or natural this or that), this was really an outstanding dish. Equally impressive was that our waiter knew what the brine was made of and reeled the list off without prompting when we expressed our admiration. I think we were both really impressed that, one, he responded to our foodie interest when it showed itself, and two, that he was able to do so in an informed manner that makes it obvious that the whole staff is dedicated and enthused about the experience Gioco offers. Finally, dessert, often a letdown but again, not here. Our waiter-- putting in a pitch for the dessert maker's dedication to shopping the farmer's markets and preparing things based on seasonality-- advised us that they were down to the last few of a peach-rhubarb tart, and so we snagged that along with some of the ice creams and gelati. The peach rhubarb dessert was first rate, surrounded by a peach-balsamic reduction which gave it an unexpected Christmas-baking note; and of the ice cream and gelati, a cherry-mascarpone one was the standout. Although the back room seems a bit off, the space at Gioco-- made out of two adjacent buildings dating back to the neighborhood's days as the infamous Levee district, and with exterior walls and windows still visible in the passageway to the restrooms-- has a hip, energetic urban-reclamation feel. I only expected so much out of the food itself, a solid B perhaps for mid-to-high quality Italian from an entrepreneur (Jerry Kleiner) known to put glitz ahead of cuisine on occasion, but my well-tempered expectations were substantially surpassed by nearly every aspect of the meal-- including the bill, which left us well fed with a pretty comprehensive survey of the menu for an entirely reasonable 50-spot and change each, tip included. Mike, they've got a super-hot wood-burning grill for the meats, including the chops and the bistecca fiorentina, which is one of the best steaks in Chicago. It's very properly done and presented Lugar-style, sliced on the bone. It's easy enough to see the grill in the open part of the kitchen. I'm lukewarm on Gioco in some respects, but the grilled meats are great. Every time I come back to Gioco, I'm always very pleased. I love the ambiance of their exposed brick and exposed kitchen. It was early for lunch so we were the first customers of the day but it was really a nice lunch. I had a delicious heirloom tomato salad -- dressed with a little basil oil and some crunchy arugula on top instead of your typical basil leaves. Nicely soft but flavorful mozzarella rounded it out -- and they scattered a few pine nuts which I thought was an outstanding accompaniment. I'm fond of pine nuts. I had gnocchi in a tomato basil butter sauce with shrimp and folks...i don't often order gnocchi because i find it too chewy but these gnocchi...felt like they were made out of butter. They melted on my tongue like marshamallow fluff but were of course..not. The sauce was gorgeous and silky and had just a tiny bit of heat in the background and the shrimp were perfectly done....it was a great lunch. My dining companion had a chicken breast and salad combo which he said was very vinagretty -- he was trying to watch his calorie intake but I shamelessly ordered a beautiful apple crostata with cinnamon mascarpone gelato that I savored and made a fool of myself over. It had a lovely caramel and creme anglais pattern surrounding it and the apples were crisp and tarte and lovely. Service was attentive and efficient and pleasant. The only complaint i have about Gioco is that it's hard to get a cab going back to the loop when you're done. All in all a very enjoyable lunch. Good bread, too, with some tasty olive oil for dipping. earthlydesire wrote: I had gnocchi in a tomato basil butter sauce with shrimp and folks...i don't often order gnocchi because i find it too chewy but these gnocchi...felt like they were made out of butter. I'll agree. Gioco has a very deft hand with gnocci. They're among the best in town. FWIW, the KDK restaurants Gioco, Marche, Opera and Red Light are running a "passport" promotion. dine at all four locations by Sept 15 (lunch or dinner), no minimum but at least one entree ordered, and receive a $100 cert good to any of the four restaurants. We just dined @ Marche this evening. Anyone interested in going to Gioco in the next couple weeks? Lunch or dinner. The harshest review of a restaurant would be that it made me sick. The second harshest is that it is a waste of calories to eat there. Gioco was a waste of calories... utterly and completely mediocre. We started with the calamari, which was mostly breading and very little squid. It was served with a flavorless mayonnaise-type sauce and a very acidic tomato sauce. I had the tortelloni, which was borderline too salty, and undercooked - to the point of being crunchy at the seams. My dining companions had the mushroom ravioli (extremely salty) and the papperdelle with braised "wild boar" (completely bland). We braved dessert. I sampled the orange-pistachio cannoli (extremely greasy shell that tasted as if it had been deep fried in the same oil as the calamari), and the cherry and chocolate bread pudding. Let's just say when I decline a second bite of a dessert that includes cherry and chocolate in the title, it is pretty darn mediocre. Sweet Willie wrote: FWIW, the KDK restaurants Gioco, Marche, Opera and Red Light are running a "passport" promotion. They're running the same promotion this summer, but it's for dinner only. There's also a promotion involving Marché and Red Light -- eat dinner at either one, Sunday to Thursday, $20 pp minimum, and on the way out each person receives a $50 gift certificate for the other. For some odd reason I ended up with two gift certificates to Gioco, one of which I noticed was about to expire at the end of the year. Sensing limited options for redemption, I made a reservation for Sunday night to take a friend out to dinner. A quick Red Line ride down from my 'hood and we arrived. I had never been there before and was pleasantly surprised by the interior of the place - it's a really warm and attractive space (surprising given how large it is). Beer selection was good - I had a 22 of the Flossmoor Station IPA, which was a little on the spendy side (not sure what the retail is), but not unreasonable. For starter we had the fried eggplant with fresh mozzarella, basil, and cherry tomatoes in a really nice tomato broth. This came highly recommended by the waiter and was really savory and delicious. The eggplant was slightly crunchy on the outside, warm and delicious inside without any bitterness. The part that really got me here was the tomato broth - warm, rich, but as a broth it was light and not overly heavy. We then shared the pork chop with brussel sprouts, pears, and pancetta, which was good, but unfortunately overcooked. Again the saucing was light, yet flavorful, and didn't at all leave me feeling heavy or overwhelmed. We also had an order of the pasta (can't remember the shape of pasta... not a homemade one) with a classic mixed-meat ragu, which was good, but nothing special. As a last-minute add-on we ordered a pizza (having seen the wood-fired oven and becoming curious), with tomato sauce, fresh mozz, prosciutto, and arugula. Ehh. The toppings were exactly what you'd expect, but the crust was lackluster. Not sure I'd go that route again. Overall, a nice meal. I'm not sure I'd rush back, but would definitely go again. The sauces, as mentioned above, were really stand-out in my book. I think Gioco is an embarrassment to Italian restaurants. That place is horrible. I've been several times, trying to give them the benefit of the doubt bc I used to live just a few blocks east. Never again. rp60605 wrote: I think Gioco is an embarrassment to Italian restaurants. That place is horrible. I've been several times, trying to give them the benefit of the doubt bc I used to live just a few blocks east. Never again. Although it's not our favorite and we haven't been for some time, I think any restaurant that you intend to criticize deserves at least the benefit of an explanation. Why is it an "embarrassment"? Why is it "horrible"? A review is only as valuable as the reasons and explanations it offers. Would you mind explaining your reasons? Last edited by Gypsy Boy on January 7th, 2009, 2:32 pm, edited 1 time in total. Although it's not our favorite and we haven't been for some time, I think any restaurant that you intend to criticizes deserves at least the benefit of an explanation. Why is it an "embarrassment"? Why is it "horrible"? A review is only as valuable as the reasons and explanations it offers. Would you mind explaining your reasons? Agreed. As I outlined in my review/comments upthread, I didn't think it was outstanding, but by no means would I call it "horrible". I've definitely had way better, I've certainly had way worse. My use of the word horrible in this context refers to the total experience. Believe me when I say that I have been very accomodating with this restaurant. I've gone for brunch, lunch and dinner on various occasions and unfortunately have been disappointed every time. Perhaps I have high expectations on Italian food. To me, italian food focuses on simple but excellent ingredients cooked to enhance its flavors. Gioco's haphazard kitchen neither uses the best ingredients nor cooks its ingredients well. I've had worse as well but compared to other KDK(?) restos I expect a little more. Opera is consistent and its staff friendly and professional. I had the mussels appetizer one day and complained about the abundance of cracked mussels. The waiter proceeded to tell me that it happens, sometimes the shells shatter in the pan. REALLY? Come on. On another occasion, at brunch, I sent some bacon back bc I specifically asked for soft, chewy bacon, bc I was in a soft chewy bacon kind of mood. They returned my bacon to the kitchen brought the plate back, NEVER CHANGING THE BACON, I saw the whole thing as I was just on the other side of the expediting area. I did eat it anyway though. Its a shame really. The South Loop could use a proper Italian resto to help people like me get out of Museum Park and walk over and grab a bite instead of getting in the car and going elsewhere. The kitchen at Gioco needs to take a stroll across the street to Opera and take notes on customer service, professionalism and cooking techniques. Have any fans or foes of Gioco been there recently? Your thoughts? I used to love this place back in 2007-2008ish. Then their chef changed (I think), and things seemed to go downhill a little. I know that's sounds like some unfair generalizing, but I can't really put my finger on it-- the menu didn't change dramatically, but the pasta and beef dishes, and the desserts, just didn't seem quite as good. There were other small changes, too. They removed the small, delicious (and free) olive dish, cut down on the bread, and replaced the lovely paper, calligraphy-style menus with Word-processed, vinyl covered folder things. Service seemed to get slower, although those might have been some off nights. 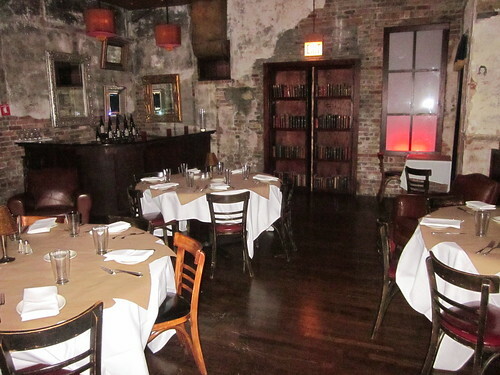 I love the back speakeasy rooms, and had in fact planned to have my wedding there in the late Fall--partly because I still have fond memories of Gioco in its early days, partly because it's hard to find a non-homogenous venue (that serves food) for just 35 people. They're holding a date for me, but I'm worried about the food! Any updates, anyone? I was there exactly a year ago with a small group myself. The dinner was very good, but I didn't exactly order the tough stuff. I put together my own family style menu. It included a few orders of the paperdelle with the boar ragu and the giant porterhouse for 2 (which comes sliced and put back on the bone, and which I ordered 2 for 12 of us so each got a taste). I also ordered a couple roasted chickens (maybe 3 or 4 orders), and asked them to cut it into pieces. I added salad and app a total of 6 first course orders. This was less expensive and better than going through the banquet menu. The boar ragu and the porterhouse are my favorite items there, and all were happy with the meal. 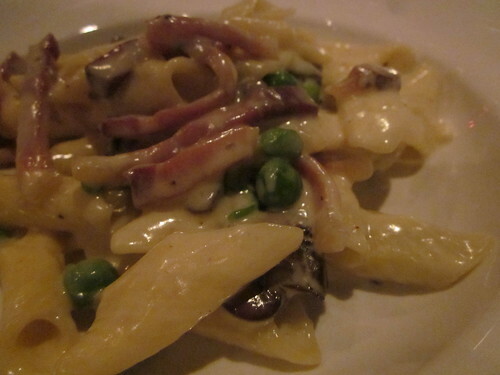 Had Garganelli last night: pasta with salty speck, sweet peas, earthy mushroom, and creamy parm, a beautiful combination of flavors, simple and delectable. I usually avoid cream sauces on pasta (Alfredo is my idea of gustatory hell), but this light, lush sauce was excellent. Gioco splits dishes like the pasta without an extra plating charge, which is mighty decent of them. Many restaurants ding you with an obnoxious upcharge for dividing portions onto two plates (usually just a few bucks, but an annoyance because diners rightly feel nickel-and-dimed). 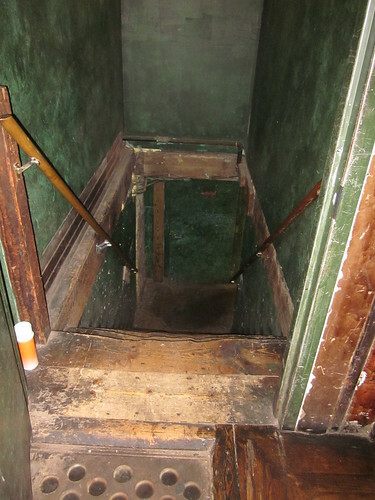 Backroom dates back to 1875; it has spooky basement with an old safe. We were guests of management, so Hamid the manager came over to talk to us. He told us that when Gioco opened 14 years ago (! ), this area of the south loop was kind of rough: cops would sit in their cars outside the restaurant to ensure that diners made it back to the vehicles. Now, of course, this ‘hood is uber-trendy, much like the Randolph area that Jerry Kleiner also pioneered with Vivo and Marche. Whatever you may think of the guy, you have to admit: he has vision. Kleiner happened to be eating at Gioco last night; his fashion sense is unique: he was wearing white dress shoes with white shorts and he actually made it work; I caught a few peeks of him tearing into a rib eye with his bare hands. Has anyone eaten here recently? I'm looking for a spot near Auditorium theater for an early dinner with my family after a Joffrey matinee this Saturday. From what I've gathered, it looks like the food is pretty good and it is now byo, but I was hoping someone had a recent experience (good or bad). Chicago Firehouse and Mercat a la Planxa seem to be the other obvious choices in the area, but neither one of those does much for me. Thanks. Was thinking of a birthday dinner there, but have heard some buzz that things are not what they were. Any recent experiences, or even hearsay? Gioco seems to be back in the groove. Visited a couple of times in the last few months and the papperdelle was first rate with true Tuscan earthy goodness whether it was covered with a boar or duck sauce. Both the gnocchi and risotto proved to be good choices, and the rich chocolate cake dolce that followed was excellent. A small wine list but a couple of nice $40 selections.